Bill Cameron is a bottle digger and collector, and a fellow member of the Nor’easters Metal Detecting Club out of Stamford, CT. He is also a very talented writer, and contributes his stories to the club Newsletter and my blog. Thank you Bill! I have a vivid memory of a funeral and burial of a dime store cast metal soldier who literally lost his head in battle. I was seven or eight and the burial was conducted in my side yard with all the proper respect. Using one of my mother’s soup spoons as a shovel, I struck something metallic. 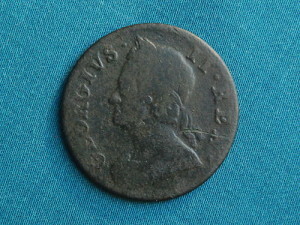 It was a coin; a British penny of King George dated 1757. I was hooked! For my birthday I requested a pirate costume. Pirates find Treasure and I wanted to be one. I still do. What is Treasure? Is it that Mythical mason jar of gold coins or a huge 10 karat diamond ring or perhaps that bronze Viking plaque proving a pre Colombian settlement in Stamford, Connecticut? Or could it be something else? Could you ever eat Treasure? Ages ago my young cousin and I went fishing at a Town Reservoir that is now off-limits to fishing. The lake has an earthen dam at least 100 feet high above the valley floor below. Access to the top was up a steep set of steps made from railroad ties. Halfway up the hill I noticed something. Alongside the steps on the grassy slope was a six-foot square patch of ripe wild strawberries each about the size of a nickel. Fishing was forgotten. 50 years later I can still taste the sweetness of those berries with the morning dew still on their leaves. Years after I looked for them at the same place but I never found them again. That was treasure. There is treasure for the eyes and heart, too. On a bottle hunt along a deep woods trail in Westchester County, New York, I came upon the only blooming Lady Slipper orchid I have ever seen. It was breathtaking! I left it untouched hoping it would reproduce.That was treasure. There are treasures that just seem to put a smile on your face. Late one night I was driving the back roads to the Danbury Yard where I worked Metro North’s third shift. I stopped to watch a scene. I saw a young red fox, a kit, not much bigger than a squirrel. The fox had a dead bird in its mouth; it was probably its very first kill. That fox was so proud of its trophy that I swear it strutted alongside the road hoping the world would see. That is a treasure. My father known as “Wolfie” smoked a pipe for the better part of his 75 years. Every Christmas his grandchildren honor his memory by hanging one of his pipes on the Christmas tree. The room seems to fill with the smell of pine and “Prince Albert” tobacco. That is treasure. So what is a Treasure? I say it is whatever you find that makes you happy and created a lasting bit of joy in your heart. Don’t get me wrong, a Twenty dollar Double Eagle gold piece would be very nice, too! More about Bill: Bill Cameron is a retired Metro North Mechanical Foreman, and has been a bottle digger and collector for over forty years. As past president of the Greenwich Antiques Bottle Collectors Club, he has lectured on bottle collecting and patent medicine at local churches and libraries. Besides bottles, he enjoys painting, writing, furniture restoration, fishing and clamming. Bill and his wife have three married sons and 2 granddaughters. Bill has moved 5 times in his lifetime but never left Cos Cob, CT. Thanks Bill, really enjoyed that very much….. Well said. What a great story, thanks for posting it. You never know the interesting stories people sitting right next to you have unless you start a conversation! I’m sure Bill will appreciates the kind words. Thanks again Bill!